Right now she is eating three meals a day, and sometimes an afternoon snack as well. We usually do jarred baby food (we like to get the organic varieties, such as Earth's Best ) and dry cereals like Cheerios and Rice Krispies for breakfast. For lunch, some favorites are crackers and cheese and scrambled eggs. Sometimes she eats what I'm eating if it's manageable with her eight teeth and tiny mouth. 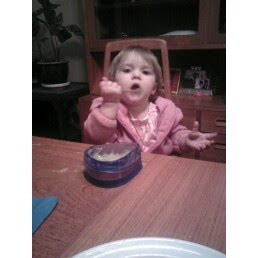 For dinner, we try to feed her what we're eating (she loves corn, rice, potatoes, and cooked veggies). The general idea is that we start by offering what we're eating. If she won't eat that, then we try purees and yogurt, if she won't eat that, then we try cereal or crackers. Sometimes after she's had a few bites of something she likes that she can feed herself (such as Annie's Cheddar Bunnies ) she is more open to taking in other foods, too. I have found that feeding her is all about patience. If she turns her head away or throws things, I just go about eating my food, or play with her for a minute or two, and try again. About half the time, on the second try she is ready to eat. She sits in her Bumbo on a chair pulled up to the table with us most of the time, or in a high chair or in our laps at restaurants. I also give her a snack cup full of crackers, raisins, or yogurt melts to graze from throughout the day and during car rides. She is also still breastfeeding about four to five times a day, and once at night. In general, I think her eating habits are fairly typical of a one-year-old, but like we had a longer road to get here than most. Maybe it would have been easier if I would have followed the standard directions and started her with rice cereal, then moved to veggies purees, then fruits, and so on. Or maybe not? I have a strong feeling that Sweet Pea's eating habits are just an expression of her personality. What are your kids favorite foods and preferred ways to eat? Have your parents shared any stories about what it was like feeding you as a toddler? I'd love to read any insights or ideas in comments, as always. That's great she's eatting from a spoon! Ethan just eats with his hands and I spoon feed him. He eat's just about anything. But I can't get him to eat cheese. Yep, Ezra has preferred to feed himself for about a year now and loves using utensils himself. He usually just eats what we do. In addition, he eats lots of yogurt and loves fruit. He doesn't seem that keen on vegetables, but I think perhaps I'm not being creative enough about how I serve them. He was asking for salsa for several days. He'd go to the fridge and say, "Salsa, salsa, salsa." He even dipped his apples in it. Strange. I'm a little nervous to hand control of the spoon over to Pebbles(her hair is in a tiny ponytail today!) but I have to let her do it herself someday. I just dread the mess plus she seems to prefer using her fingers to eat. I want to get one of those bowls with the suction cup on the bottom, maybe I would feel better about the whole thing.